This was a "shoot and run" attraction in Des Moines that happened to be on our way. Of course, the cow and her calf stand on a wedge shaped plot of grass in front of the Anderson Erickson Dairy where three streets intersect. And it's not really a pedestrian-friendly area. Kristy and I were undaunted though. After parking our car in an empty parking lot across the street, we ran across the busy street as carefully as possible to get up close and personal and to take our requisite pictures. 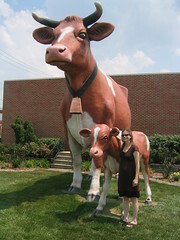 The giant cow is reported to be 20 feet tall, while the calf stands about 5 feet. From the World's Largest Cheeto to the Hobo Museum to Albert the Bull, it's all in here. See what we thought the must-see, cannot miss attraction of Iowa is.